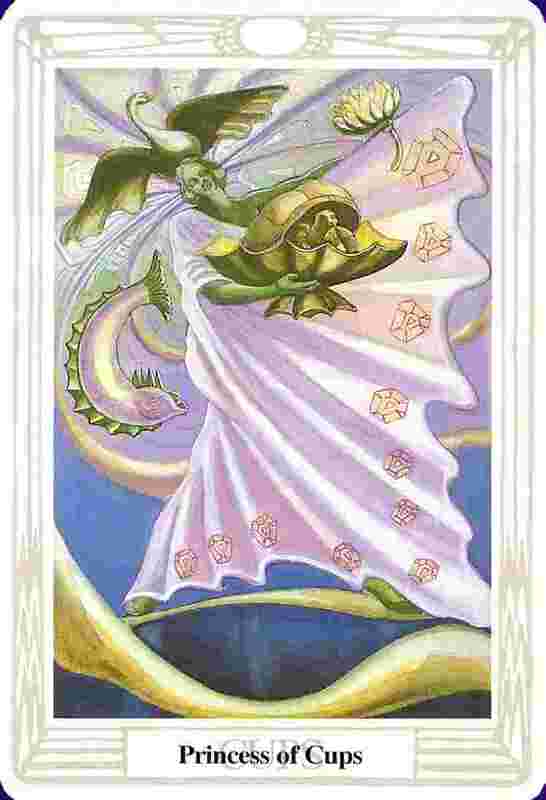 The Princess (Page in the Rider-Waite tradition) of Cups is the court card associated representing the personality than emerges from the Earthy (Malkuth) aspect of Water. This card is the Earth of Water, and represents what is solid, practical, and material in the suit of Cups as manifested in a personality. She is water given birth. As such, the Princess of Cups is how emotion and sensuality manifest themselves in reality. She is sweet, gentle, and tender. She is gracious and romantic, in the feminine sense of the word (as opposed to the masculine sense, which is embodied by the Prince of Wands). Emotions and feelings mean a great deal to her, and she is often affectionate as well. She also reflects some of the Queen’s mystique, and often is exploring herself, and may cause others to do the same. She acts as a mystic much of the time, trying everything she can to find out who she is. She is also, however, given to the earthy pleasures of the world, and so often is given to moments of wild abandon, where she will let herself go, and also can be in a state of perpetual rapture, having given in to the pleasures of life. She is very in tune with her own feelings and those of others, and isn’t afraid of gratifying them. The Rider-Waite illustration shows a young man (a Page), looking content and staring at a fish in the cup he’s holding. This image best represents the idea of contentment through the Suit of Cups. The Thoth art, on the other hand, represents best the idea of perpetual rapture; her head is thrown back and eyes closed in ecstasy, floating in a dream world, yet bearing in her hand a tortoise, a symbol of Earth. In a reading, this card asks you to examine the roles of personalities like the Princess in your life. Do you know anyone who is introspective, philosophical, meditative, who genuinely cares for others and does their best to help everyone. They are not afraid of losing themselves in the moment, and may be prone to taking drugs and living a lifestyle of constant abandon. They think life is good, and will try to spread their cheer to others. They may even use drugs as a means to self-enlightenment; hippies are prime examples of the Princess of Cups. Reversed, this personality is hidden somehow or is expressing itself in different ways; is there someone you know who wants to be able to just live their life as if only the moment mattered, but can’t? Is there someone who gives in to the hedonistic lifestyle in order to hide from something?